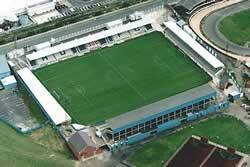 This ground was described as 'tidy' by our reviewer, and has a capacity of 8,240. There has been much redevelopment over the last few years, with The Cyril Knowles Stand and the Rink End both converted to all seater stands. There currently a plan to modernize the Mill House Stand, so watch this space! The away fans will usually find themselves in the Rink End, where the views are quite good, although, considering it's a new stand, the facilities are a little disappointing. Exit A1 at junction 49 and follow the A19 towards Teesside. Exit the A19, onto the A689 dual carriageway, following the signs for Hartlepool. Continue over the next four roundabouts, following the signs for Town Centre. Go straight over the traffic lights by the Middleton Grange Shopping Centre (...signposted the North, Sunderland, Durham A179, A19). Continue past the Hartlepool Mail (...on your left), and then take the left hand lane into Clarence Road. The ground is about 200 yards along, on the left hand side. Exit A19 at the junction with the A179 (Hartlepool), and turn left at the junction follow the A179 towards Hartlepool. Continue over a couple of roundabouts, and then turn right into Easington Road at the third. Continue on the A179 (Town Centre), going straight over the next three roundabouts. Turn right into the new docks development, at the next (4th) roundabout (...just after the blue-and-white railway bridge). As Clarence Road is one-way, it's best to head for the Jackson's Wharf car park. Therefore, go straight over the next roundabout, and you can't miss the car park. The closest station to the ground is Hartlepool, which is a third of a mile or so away from the ground. To get to the ground, exit the station approach, and follow Church Street. When you get to the church, turn right towards church/art centre. Keep straight on, past church, to roundabout. The ground is visible from here. The following buses either go to Marina Way or close to the ground... Marina Way...7 and 7A, 3A, 4, 2 and 2A, and 14. Others... 6, 36, 1, 3 and 12. There is a free car parking located in Clarence Road, next to the ground. There is some side street parking, but you probably need to be early for these! Jackson's Wharf, which is about a five minute walk from the ground, has loads of parking spaces, and doesn't normally get full! This is one for the train travellers, as it's located in Church Street. We found there to be numerous real ales, a warm, friendly atmosphere. Generally a good pub! This pub is located in Whitby Street, and serves a variety of ales. A country type pub, within beams etc, and the actual building is over 200 years old! A real winner due to the food... the winner of the town's best pub food award for the last two years!!!. There is also the customary Pool table, with a large screen TV. This a relatively new pub, and is located on Victoria Road. This is a Brewers Fayre, serving good food, with views over the Marina. Located in Maritime Avenue. This pub is about ten minutes walk from the ground. It's just a basic 70's style boozer which serves good beer and has a friendly atmosphere, easy to get to, situated on hart lane. 'I am just letting you know of a couple of Hartlepool pubs which are worthy of inclusion. They are the Jacksons Wharf on the Marina, about 5 minutes from the ground, which is full of HUFC memorabillia and goes out of its way to welcome away fans. Also the best pub for real ale and friendlieness is the Causeway, situated around the corner from the Camerons Brewery about 15 minutes walk from the ground. I would not be too sure of drinking in the Tavern or Yates in a group, but thats just my opinion. I hope this is of help. If you are a registered user then you can login, and create your own personal review of Hartlepool United Football Club - Victoria Park. These reviews can be private or public.